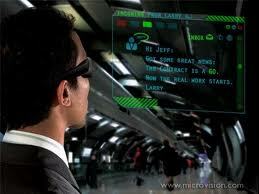 The Virtual Retinal Display (VRD) is a personal display device under development at the University of Washington’s Human Interface Technology Laboratory in Seattle, Washington USA. The VRD scans light directly onto the viewer’s retina. The viewer perceives a wide field of view image. Because the VRD scans light directly on the retina, the VRD is not a screen based technology.